I suggest you visit Sam Ruby’s planet.intertwingly.net. Now that I’m back blogging, I have found that if I write a post in the morning, and then write another later in the day, or the next morning, then there are only a handful of blog posts from all the other members of the planet in between. Perhaps a more interesting question than “Where have the bloggers gone?” is “What were they doing in the first place?” In my case, from 2003 through 2006, blogging was part of my gig at InfoWorld. For many of the others listed at planet.intertwingly.com it was a professional activity too. Collectively we were the tech industry thinking out loud. We spoke to one another through our blogs, and we monitored our RSS readers closely. That doesn’t happen these days. Obviously Twitter, Facebook, and (for geeks particularly) Google+ have captured much of that conversational energy. Twitter is especially seductive. Architecturally it’s the same kind of pub/sub network as the RSS-mediated blogosphere. But its 140-character data packets radically lowered the threshold for interaction. It’s not just about short-form versus long-form, though. Facebook and Google+ are now hosting conversations that would formerly have happened on — or across — blogs. Keystrokes that would have been routed to our personal clouds are instead landing in those other clouds. @judell: since your blog is on (our very own) @wordpressdotcom, you can setup the publicize option to push your posts: http://wp.me/PEmnE-1ff. Nice! This is an excellent step in the right direction. Thanks for the reminder, Stephane! What’s next? Here are some things that will help me consolidate my output in my own personal cloud where it primarily belongs. Different messages to each foreign cloud. Because headlines often need to be audience-specific. Private to my personal cloud, public to foreign clouds. Because the public persona I shape on my blog serves different purposes than the ones I project to foreign clouds. Much of what I say in those other places doesn’t rise to the level of a public blog entry, but I’d still like to route that stuff through my personal cloud so I can centrally control/monitor/archive it. Federate the interaction siloes. Because now I can’t easily follow or respond to commentary directed to my blog echoes in foreign clouds. Or, again, centrally control/monitor/archive that stuff. In my Wired.com column I often reflect on these kinds of issues. The personal cloud services I envision mostly don’t exist yet. But it’s great to see WordPress.com moving in that direction! Author Jon UdellPosted on 10 Aug 2012 10 Aug 2012 Categories . 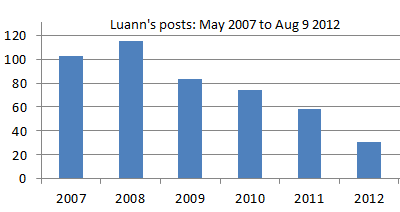 I see similar pattern with my blog, to be honest. 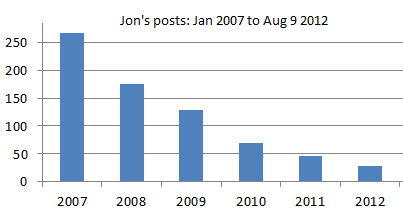 My blog went from 500 daily visits early 2006 to about 25-50 today. I’m sure my output is partly to blame. Also, last year I did a “What was I talking about in previous months” series of blog posts where I highlighted what I thought were the most interesting posts from the same month in previous years, going back to the blog launch in 2001. That of course led me down the rabbit hole of the comment threads on those old posts. I’d say 90% of the self-links back to my commenter’s blogs are dead. Those of us that were somewhat prolific bloggers have definitely scaled back, but the casual blogger seems to have quit completely, and deleted their blogs in the process. Glad publicize is working out better than first expected. Very interesting points highlighted in the “what’s next” section too. Not entirely “user-friendly”, but you can somewhat achieve the “Different messages to each foreign cloud” part with the existing publicize setup. The trick is that once a post has been “publicized” to another network, it does not get pushed again. 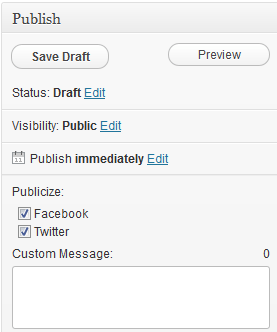 So you can click on one of the checkboxes (say “Twitter”), customize the message and publish. Then change the message, click the Facebook box (no need to uncheck Twitter), and update the post. The messages will be sent with each their own tagline, to each network, separately. Again, not really a UX for it, but could be a stop gap solution for you in the meantime.